As the capital of Hawaii, Honolulu is the largest city in the Hawaiian Islands and the main airport and seaport location. Previously named Kou, Honolulu means “place of shelter,” and evidence shows that the first settlement in the area was as early as the 12th century. 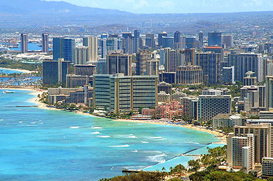 The city of Honolulu is made up of various districts. Downtown Honolulu is known as the financial, commercial, and governmental center of Hawaii. The tallest building is the 438-foot First Hawaiian Center, located on King and Bishop Streets. The Hawaii Pacific University’s downtown campus is also located there. Downtown Honolulu is also home to various cultural opportunities, such as the Honolulu Symphony, which was established in 1900 and is the oldest U.S. symphony orchestra west of the Rocky Mountains. The Honolulu Academy of Arts has the largest collection of Asian and Western art in Hawaii, as well as the largest collection of Islamic art, in the Shangri La estate. The Hawaii State Art Museum also boasts a collection of traditional Hawaiian art. Other attractions include the Honolulu Zoo, the main zoo on the Hawaiian islands, the Waikiki Aquarium, as well as many botanical gardens. Named the fittest city by Men’s Fitness in 2004, Honolulu is also home to the Honolulu marathon, and the NCAA football Hawaii Bowl and Pro Bowl.